At our gift shop, Pandora's Box, you can purchase mementos of your visit today and gifts for loved ones. 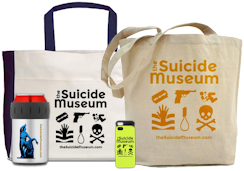 Check out our Suicide Museum logo wear and cool swag in our online shop. Be the envy of all your friends! 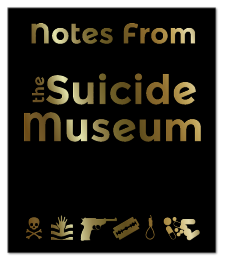 Don�t miss out on our handsome limited edition of Notes from the Suicide Museum, showcasing all the suicide notes we have in our collection with translation and commentary. If you are a reader we have copies of Sylvia Plath�s The Bell Jar, Jeffrey Eugenides� The Virgin Suicides and of course Romeo and Juliet, and Anthony and Cleopatra. 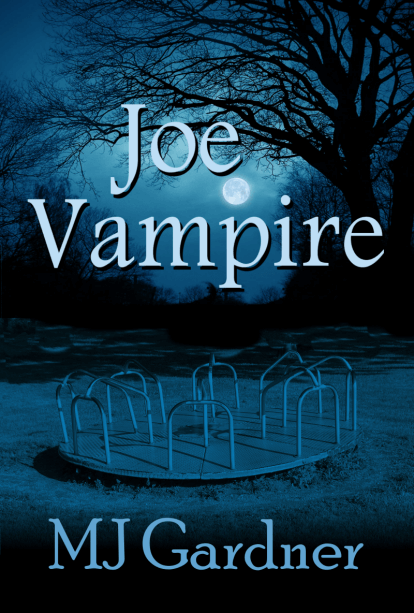 We also have books for those younger loved ones, such as Where�s Mommy and Baby�s First Funeral. Our collection of music includes Donalyn�s Music for the Dying, and our fundraiser K-Tel compilation album, with such suicidal hits as Ode to Billy Joe, Suicide is Painless, Knocking on Heaven�s Door, Paint it Black, Hey Hey My My and Baby Don�t Fear the Reaper. 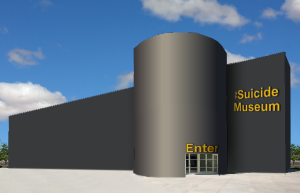 For the more practically minded we have plenty of rope, blades priced from bargain-basement box cutters up to replica ceremonial Japanese tanto, a variety of poisonous chemicals, and plans for assisted suicide machines designed by Dr Kevorkian, Exit International and Philip Nitschke. For all your purchases we provide a handy Exit Bag.